Description: This perennial wildflower typically consists of a cluster of unbranched erect stems about 3-9" tall. These stems are terete, white (sometimes tinted pink), translucent, fleshy, and hairless. The alternate leaves are scale-like and small; like the stems, they are white, translucent, and hairless. Each stem terminates in a single white flower about ½–¾" long that is nodding to nearly erect; this flower is narrowly bell-shaped, consisting of 2-4 sepals and 4-5 petals. The petals are longer and more persistent than the sepals. Within the interior of the flower, there are 10-12 stamens surrounding a stout style. The time of year when flowers are produced can be highly variable, extending from late spring into the fall. However, the blooming period for individual plants lasts only 1-2 weeks. The flowers produce no obvious floral scent. After the blooming period, the entire plant becomes dark brown or black, and each flower is replaced by an erect ovoid seed capsule about ½" long. This seed capsule is 5-celled and contains numerous tiny seeds, which are easily blown about by the wind after the capsule splits open. The root system consists of a mat of brittle fleshy roots. This wildflower is saprophytic and lacks chlorophyll in its tissues; it forms either a symbiotic or parasitic association with mycorrhizal fungi through its roots. Cultivation: Cultivating Indian Pipe is very difficult, if not impossible; plants that are transplanted from the wild are highly unlikely to survive. Abundant woodland humus and the presence of appropriate fungi are required for survival. 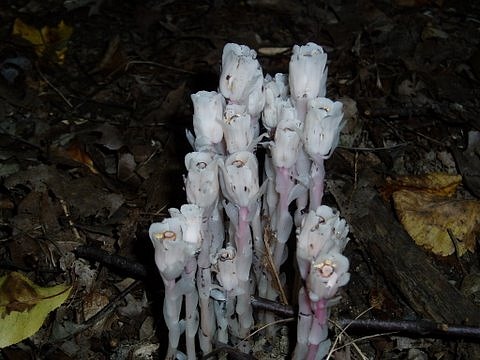 Because Indian Pipe does not rely on photosynthesis, it can adapt to deep shade. Range & Habitat: Indian Pipe can be found at scattered sites throughout Illinois (see Distribution Map). In Illinois, habitats are largely restricted to rich deciduous woodlands in areas with abundant humus. These woodlands are typically dominated by either maples or oaks. Indian Pipe also occurs in woodlands where coniferous trees are present. This unusual wildflower is normally found in high quality woodlands. Faunal Associations: Information about floral-faunal relationships for this species is very limited. The flowers are cross-pollinated by long-tongued bees; such insects probably seek nectar. Bears may feed on the plants when they develop above the ground surface, or they may dig up and feed on the root mass (the latter behavior has been observed for Grizzly Bears in British Columbia). 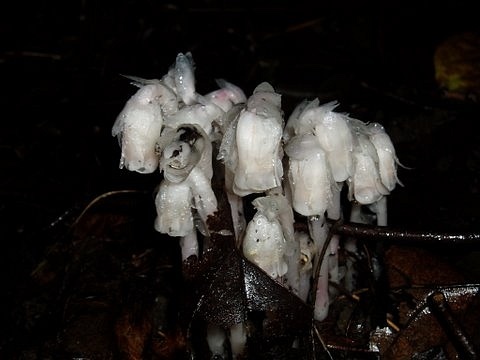 Indian Pipe is not known to be toxic. Photographic Location: The photographs (Copyright © 2008) were taken by Paul and London Showers near Wilmot Woods in Lake County, Illinois. Comments: Because of its ghostly white appearance, some people may confuse Indian Pipe for a fungus. This species belongs to a small group of saprophytic flowering plants that have abandoned photosynthesis. A similar species, Monotropa hypopithys (Pinesap), also occurs in Illinois, but it is less common. Unlike Indian Pipe, Pinesap produces several nodding flowers on each stem; these flowers are arranged in a short raceme. Pinesap is more likely to be tinted different colors (including bright red), and it is often pubescent.